Today's episode is the 2nd of a three series podcast on heart-centered social media and the practice of the presence. This episode is about BEING HEARD on Social Media, and what we commonly and mistakenly do to sabotage ourselves whether knowingly or unknowingly. The last episode is about BEING SEEN. Our next episode after this is about BEING UNDERSTOOD on social media. And what we do, whether knowingly or unknowingly, that keeps us from being 1000% ourselves in social media - to be whole-heartedly and authentically You, to be the one and only - the original and inspired, guided and vision led YOU! So what is it that we are doing that is sabotaging our whole intent of being seen heard and understood on our social media platforms? And all of this: being seen, being heard, being fully understood goes deep. These three needs are The life blood of your success and happiness, both in social media in your business, and life in general. So I'll just jump right in. Typically there are 2 main reasons why we feel unheard on social media. It could be a deeper issue that you've been personally grappling with your whole life. So let's talk a bit about not being Heard, issue # 2. When what you're saying is not resonating with your audience. This issue has 2 moving parts. Who is listening - how they are receiving the info & whether what you are saying appeals to them. In marketing language, the 2 corresponding items I just mentioned- what you are saying and who is listening - boils down the 2 items; marketing message and target audience. The question is whether your marketing message is speaking to your target audience. Here's an example: If you're a mom or a teacher, you know that different children need to be spoken to differently. Each person is an individual and has different things that motivate them. So you wouldn't talk to your 10 year old the way you talk to your 4 year old. You would not talk to a 9th grader in school the way you talk to a 2nd grader, right. These children - individuals - are at different places on life and they need to be spoken to appropriately. And the operative word is "spoken to," not "spoken at." Communication is a 2 way street. So in business & marketing terms, in order to be heard, you must focus & tailor our message to a specific, not age appropriate, but level appropriate language. If you are offering a program, for instance, of losing weigh and getting in shape, you would need to talk and tailor your message to your ideal client. How you position your program, along with presentation and packaging will vary depending on whether you are talking to an18 year old single man or a 45 year old mom of 4. Customers Goals, ideals, desires outlook and stage in life are different so we must begin with the end in mind: who we are serving. While building muscle is an important part of weigh loss and overall health, the mom of 4 and 18 year old single male might hear what is presented to them differently. They will want different things in life. They have different motivations and so you must look beyond what's on the surface and tap into the psychographics of your ideal client to create a specific message with words that will resonate with your audience. There are essential 5 questions that you need to be able to answer that will create a transformational experience for your customers. Remember that what you have to offer solves or resolves something that is a hurdle, or a difficulty for your ideal Client. Here are the 5 indispensable questions. (1) What is it that you are trying to solve or resolve that your ideal client is having difficulty with. Is it that they have a lack of time? Skills? Creativity because they are overwhelmed? Identify what they problem is. (2) What is it that they need? What is the most baffling, challenging thing for your ideal client that you know, have expertise in, or posses that can help them? What it is that you have - is it a solution to improve their life or a program that helps them deal with their grief, exercise regimen…? (3) What do they struggle with? (4) What tools and resources can you share that would help them? (5) How it is that you can help them? How do you support them in what they are trying to create? When you have clarity to the answers for these 5 essential questions, you will be able to specifically addressing your clients, using their words to answer the questions they may not even know to articulate. And you suspect it is the 2nd issue I mentioned earlier - being heard as something you've been grappling with your whole life. I've prepared a guided meditation you can listen to so you can truly hear what wants to express. A time to relax and truly listen to your heart and tune in to intuitive guidance. This link as also available in this post at pathofpresence podcast - this is episode 10 of being Heard. Last week I talked about self alignment using the practice of yoga - aligning our practice both on and off the mat. The deeper practice of yoga really, is listening. The practice of yoga, learning to do yoga - is a MINDSET CHANGE of being open and receptive to guidance. Tempering the outer (the surface layer of who we are) with the inner / underlying soul hat wants to express. The Outer - being the guidelines and the rules in life. The Inner - being the intuitive guidance and wisdom of what's right for us. The stuff that is us: our inner world of beliefs and values - our spiritual practice - what we believe and hold to be true needs to be in alignment with who we are. And second, the outer expression of who we are (in life, as in social media) needs to be in alignment with the Truth of our being. Being seen for who we are, what we stand for, and what we're all about, is one of the most core issues of a human existence. Self sabotaging mistake #2 that make on social media that keeps us from being heard is that we go at it - posting, commenting and going about - without first hearingourselves. The answer and correction to resolving self sabotaging mistake #1 on social media - the fix to this problem of not feeling Heardby others is that we must 1st and foremost hear ourselves. You have a gift and service to share with the world. What you have to offer and say is important - so don't give up. Just a tweek here, and an “aha!” there will bring new life to your message. There are people out there who absolutely need you - they need to hear your message - they need to share your program or service and more importantly - they need to hear what your soul wants to express, so go for it!! You have everything you need to success, to be seen, heard and understood. Be sure to download the tools that go with this episode and we'll see you next week. 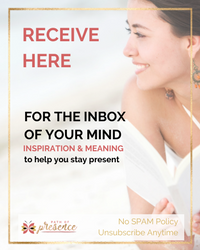 If you would like to pause and dive deep, taking some time out for presence, and truly see yourself, be sure to download the free meditation that goes with this podcast.